Mark Herzlich is a tough guy. You have to be tough to play the linebacker position at Boston College and to make the big leagues with the New York Giants and win the Super Bowl in 2012. Mark’s biggest battle came after being named the ACC Defensive Player of the year and being touted as a potential “top 10” pick in the 2009 NFL draft. Mark was diagnosed with a rare form of bone cancer called “Ewing’s sarcoma”. He underwent incredibly intense rounds of radiation and chemotherapy. He had to sit out the 2009 season but on national television, Mark was able to announce that he was cancer free. In 2010, he returned to the gridiron at Boston College but did not play as he did before cancer. He was happy to be back on the field and he continued to train for his sport. In 2011, Mark was not drafted by any NFL team but he felt he was fortunate when he was signed by the New York Giants and started two games the following season. In two years, Herzlich went from battling cancer to someone who beat cancer to a Super Bowl champion. Herzlich does not just impress on the field, but he hosts celebrity golf tournaments, volunteers with the Tom Coughlin Jay Fund Foundation and speaks with young pediatric cancer patients and survivors. He is an author, the face of Uplifting Athletes and inspires others with Make-A-Wish. 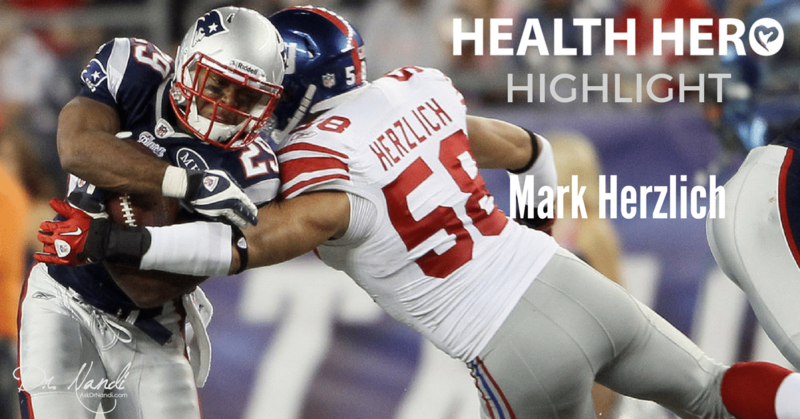 We are proud to introduce you to Mark Herzlich and to call him our Sports Health Hero!